Update: As of 14 June, WA0TDA and W0ZSW are now on their own antenna systems. WA0TDA uses the maypole inverted vee system, while W0ZSW uses an end-fed zepp for operation on 160 through 6m, with 17 & 12 m excluded. 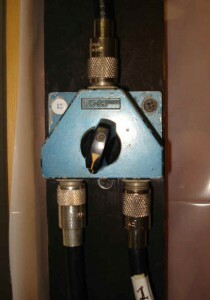 The manual antenna switch at W0ZSW is used to switch in the dummy load during testing. Summer chores… All the stuff that can’t be done in the winter gets pushed into the nice weather months here in Minnesota. The snow is gone, the days are getting long, and it’s time for yard and landscaping work. This summer that includes tree trimming and removal – and that poses a problem for the W0ZSW antenna system, a 270 foot dipole that runs through no fewer than seven trees at the WA0TDA QTH. Five of those seven trees are either going to be trimmed and shaped or removed altogether, so of course the antenna had to come down. Station W0EQO in northern Minnesota was not affected by this work and remains available. Contect wa0tda@arrl.net for WA0TDA station access or to report problems with W0EQO and W0ZSW.